Adam Equipment’s PW analytical and PGW precision balances are designed to deliver the ultimate in speed and accuracy in an easyto- use and reliable model. The attractive functional design and advanced features make the PW and PGW series your best choice for your laboratory balances. The series incorporates the very latest generation of software, which has a deceptively simple user interface for easy setup and control of a wide range of smart functions and security features, allowing simple and advanced weighing applications to be executed on the spot, without the need for complex calculations. All the features are packaged into a high power, high performance balance, saving you valuable time and resources. The PW and PGW combine the latest in product development with a company committed to your weighing needs, giving you the perfect balance of speed, performance and value. The dual display gives true flexibility for counting parts, so whether your application involves pharmaceuticals or small manufacturing components with a high counting accuracy, the PW and PGW are ideally suited for you. The display shows both the total weight on the platform as well as the number of pieces counted and, at the touch of a button, the unit weight of one piece can be displayed. Filling and checking the weight of objects with these balances makes it easy to meet your quality control expectations. Set your own limits and the display will indicate when the weight is too low, too high or on the mark and a selectable warning indicates when you are on target. The software’s true flexibility lets you select one or two target points. Use the capacity tracker to give you a visual perspective of your check weighing. You can compare your products against a master sample reference weight for quality control and, using the percentage weighing feature, the balance does all the calculations for you and displays the variations as a percentage. The animal/dynamic weighing mode helps you get the best readings when your environment or application is affected by influences including vibrations, oscillation or movement of objects on the platform, or air movements. The PW and PGW give you the control by allowing the user to select the appropriate filter speed for the best response. Simply using the tare key, you can automatically track every component of the weighing process, whether you need to know the value of the tared container, the goods it contains, or the total of both together. The PW and PGW’s dual display can show both the total gross weight and the net weight at the same time when needed. You can use the totalisation features to calculate each item’s weight in a batch, as well as the total during the weighing process. The data can be recalled on the screen and transmitted to a computer or printer for further analysis. Whether your application involves density measurements of liquids or solids, density calculations are simple with the built-in software that guides you through the application as you work. Below-balance weighing access is standard on all models for the ability to perform density and other weighing needs under the balance. An optional density kit for the PW and PGW (mg balances) for above density calculations or a below-balance weighing hook are available. 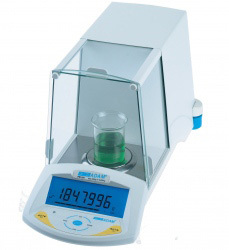 Up to 18 weighing units are included as standard, offering you the flexibility needed for every laboratory application. One custom unit allows you to perform independent custom calculations. For example; using the PW and PGW to work out a cost per weight reading, or a weight per square metre, gives you added flexibility. The large backlit LCD display has clear digits so critical data is always in view, a capacity tracker means that you always know where you are in the weighing range and an integrated second digital display shows additional information including text prompts, time / date and piece weight. The standard bi-directional RS-232 communications port integrates fully with a computer or connects to a printer, allowing easy output of information as well as a variety of other accessible options. A second port enables future expansion for external devices. Adam’s state-of-the-art technology provides a number of features to keep your balance safe and secure. Password protection software can be enabled, preventing unauthorised use. There is also an integral security mounting point for a Kensington™ type lock and cable. The PW and PGW balances meet the standards of reliability and quality that Adam’s customers expect. The metal housing is much more rugged than plastic cases and has been designed to divert spills away. The large, stainless steel pan can be removed for easy cleaning or storage.